Popular UK illusionist Derren Brown recently ran a two-part TV programme entitled “Fear and Faith”. The second part of the programme, “Faith” looked at explaining belief in God from the perspective of hard-wired emotional need. It can be viewed here (for UK residents at least). During the broadcast of this TV show, many of my Twitter comrades tweeted me to ask if I had tuned in. I commented on the tweet in a mocking, yet non-abusive manner (of course). My playful sarcasm was obviously intended to imply that I did not agree with the implication that there was rational “bases” for religious belief. 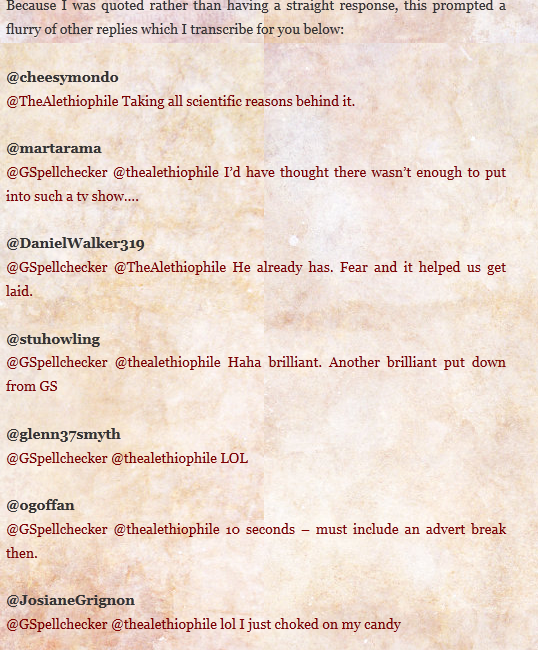 My comment seems to have partly inspired this blog post by the original tweeter. One would think that if you author a blog entry to argue against disagreement with your claim that there’s a rational basis for religious belief, then one would also think that said blog would be a fantastic platform to support and expand on that claim by way of detailing some of those rational foundations. They haven’t. The tu quoque-centric entry quickly devolves into an irrelevant straw man exercise by alluding to “some atheist are full of hate/prejudice” and further predictably tiresome references to “new atheism”. Further charges are made against me specifically for purporting something to be true without evidence. The Gods of irony are scratching their heads. Before I address the other points made, I believe it of use to detail my views regarding the TV show in question. I love Derren Brown. I think what he does as an entertainer is meticulously well crafted. In his more stunt/performance based shows, he tricks his audience, like any great “illusionist”, but with a difference. He then often proceeds to “explain” just how he managed the seemingly impossible feat by offering up choice pseudoscience, or often unrelated, but seemingly credible explanations. This is what I believe, to be his strength. The misdirection of purportedly explaining “how” he achieved something post-trick, detracts you from the genuine and simpler reasons as to why you were fooled. With increasingly demanding and sceptical audiences, this anchors his “powers” firmly within the realm of reality and intellect, rather than the supernatural, as many other performers of this nature claim or imply. I think this level of misdirection and showmanship is perfectly admirable. It’s important to be clear that Derren Brown is honest about his “dishonesty” (misdirection). To me, this separates him from pretentious clowns such as Uri Geller, or David Blaine. 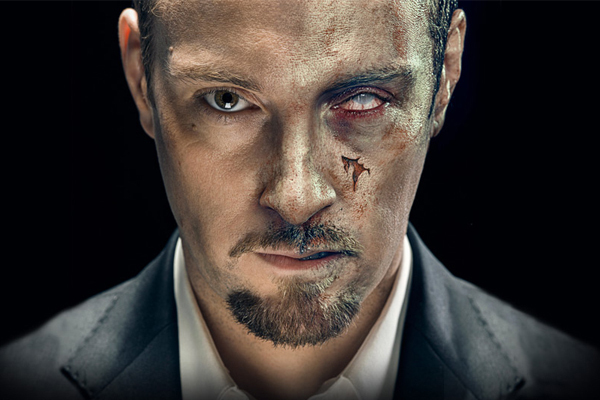 Derren Brown tells you he is void of any supernatural ability, reiterates that he intends to trick you, then, proceeds to do so with entertaining and dramatic panache. He’s also an atheist and a sceptic, but first and foremost, a performer and an excellent one at that. He is also responsible for a number of non theatrical/stunt based shows entitled “Derren Brown investigates” which take a sceptical look at “psychic ability” and “Ghost-hunting”, mainly with the view to debunk. This latest programme appears to be a blend of both formats, the factual, with the theatrical. Although Derren does touch upon well established phenomena such as pareidolia and our propensity as mammals to seek patterns in experiences or physical objects when they aren’t necessarily present (Carl Sagan hypothesised our innate ability to recognise faces as a vital survival technique), I’m more than happy to categorise this type of programming firmly under “entertainment” rather than “factual”. I have not championed this show as any sort of deathblow to religious belief. If you wish to argue confirmation bias of atheists’ unquestioning acceptance of its content (as the blog does), so be it. I’ve not witnessed this myself, nor does it make any difference to the irrational nature of religious belief. I agree with the Blogger only to the extent that if anyone wishes to cite this programme (or anything for that matter) as conclusive evidence for the non-existence of Gods, they would benefit from further research on the concepts outlined, and indeed other arguments for the existence of Gods. There’s always other “arguments”. This does not mean however, that the points put forward cannot be used to understand the cause of some religious belief. This was in fact, to my knowledge the entire and only purpose of the show. Religious belief is a mixed and complex bag, and a blanket explanation is too simple and fails to grapple with the nuances of all forms of belief, regardless of how informative and entertaining it was. In my comment to the original tweet, I actually made no claims about the credibility of the TV show, or whether I accepted its findings. My disagreement was with the implication that there is a rational basis for religious belief. If this can be demonstrated to me, I shall adjust my view accordingly. Any attempt to do so was not made in the blog entry, only a claim of a personal rational path to religious faith, which the details of, are seemingly absent. This appears to be the main point of disagreement, one the blog entry doesn’t attempt to argue a case for. Yet I have come across many atheists who could not reasonably be called rational, given their views on atheism are based very much on an emotional level, prejudiced and hateful of anything resembling what they perceive as ‘religious’. I find it peculiar and unhelpful that any references to “some hateful/prejudiced atheists” would be made at all. If the aim is to criticise the intentions/claims of the show, or subsequent reaction to it, it would seem more useful to address those claims and issues head on, without fallacious ad hominem reasoning. 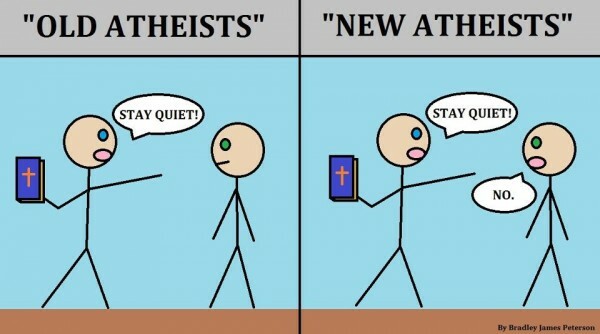 So which hateful atheists are they referring to? Why make mention of them at all? What is the relevance to the topics at hand? How does this affect the rational basis for religious belief, or lack thereof? How would an atheist being irrational make any difference to the complete absence of evidence in favour of Gods? The question of which position has a rational basis is unaffected by this. I tend not to make “hateful Christian” straw men in my arguments when discussing unrelated and clearly defined topics, however I have had first hand experience, as denoted by my #ThingsTheGodlySay hash tag for instance. A quick glance here will reveal an all you can eat buffet of hate, prejudice and abuse. Dessert? Intolerance. It’s important to note that the purpose of the hash tag is not to claim these unfavourable traits are uniquely godly, or in any way impact upon the probability of an intervening deity existing, but to counter popular misconceptions about the moral superiority of the religiously inclined. Meaning? There are examples of hate/prejudice from all areas of life. This says nothing about whether or not religious belief has a rational basis. I fail to see how it is helpful in the context of this discussion to equate atheism with inflammatory topics such as hate and prejudice, even if only in reference to “some”. It doesn’t seem conducive to the topics at hand to say the least. If citation of atheist vs godly hate/prejudice were any measure of our respective positions validity, I’m certain the religious would not come away victorious. There is an earnest desire among some atheists to disprove the existence of any kind of god, so what happens is that anything which vaguely hints in that direction is taken as a confirmation of their own (lack of) belief. This is a clear Ad hominem. The inference being that because some atheists may have an interest in siding with anti-god notions, these notions are somehow not credible. Where is the attempt in the blog to discredit the actual ideas put forward, rather than the individuals themselves? Constant reference is made to “rational bases for religious belief”, without any attempt to outline it. In my experience, atheists generally go so far as to reject the claims of Gods only, since it’s an unfalsifiable claim, and therefore impossible to “disprove” as such. This is a misleading and loaded statement at best. If someone has faith in something so extraordinary, the onus is on them to provide evidence and justification for it. 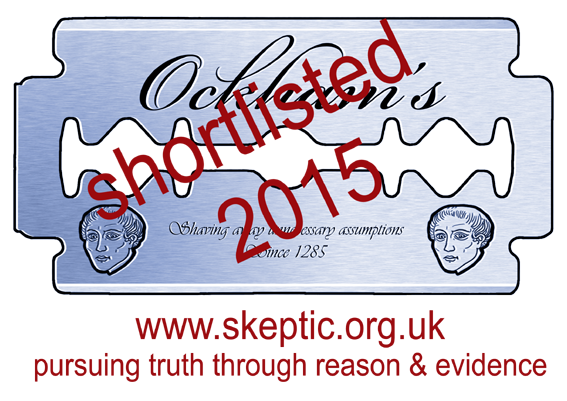 I am not obliged to provide evidence against or to counter a persons extraordinary and unsupported beliefs. The burden of proof lies completely with the believer. If it can be demonstrated how an adherence to Christianity is rational and not faith-based I shall concede as much. I assume the blogger doesn’t feel it would be a presupposition to claim there were no rational basis for belief in Zeus. Why not? What rational basis is seemingly absent from the numerous other Gods they do not believe in, but allegedly exists for their own? Why would faith even be required, if there was a rational basis? What is most concerning is the belief, in the teeth of the evidence opposing it, that there is no rational basis for belief. This, I find to be incredible. I would suggest that every rational measure we have of what is true, contradicts any biblical or supernatural “explanation”. Points about the nature of “knowing” are usually made here. An epistemological defence. My question would be what better methods exist to answer questions of this nature than logic and evidence? As with constant reference to this elusive “rational basis”, the “opposing evidence” is also missing in action too. Equally, the increasingly tiresome canard of ‘science v religion’ betrays the fact that there are a great many scientists who hold “religious” beliefs and many “religious” people hold no objections to scientific ideas or the evidence or proof which uphold them. It is widely claimed that there can be no conflict, in principle, between science and religion because many scientists are themselves “religious,” and some even believe in the God of Abraham and in the truth of ancient miracles. Even religious extremists value some of the products of science—antibiotics, computers, bombs, etc.—and these seeds of inquisitiveness, we are told, can be patiently nurtured in a way that offers no insult to religious faith. This prayer of reconciliation goes by many names and now has many advocates. But it is based on a fallacy. The fact that some scientists do not detect any problem with religious faith merely proves that a juxtaposition of good ideas/methods and bad ones is possible. Is there a conflict between marriage and infidelity? The two regularly coincide. 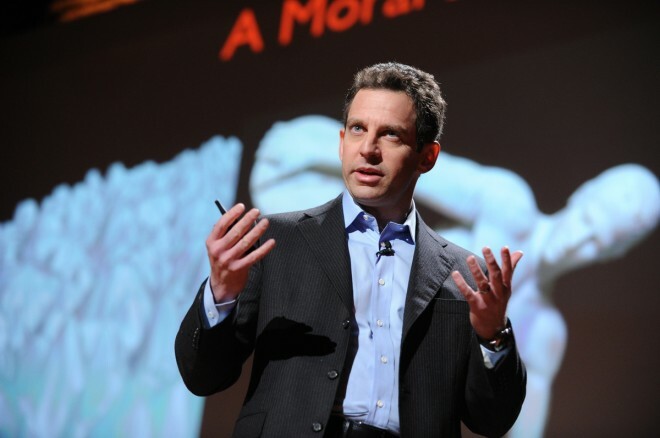 The fact that intellectual honesty can be confined to a ghetto—in a single brain, in an institution, in a culture, etc—does not mean that there isn’t a perfect contradiction between reason and faith, or between the worldview of science taken as a whole and those advanced by the world’s “great,” and greatly discrepant, religions. It’s worthy to note that the blogger has singled out the Christian God as their chosen intervening, supernatural deity. If it were possible to show how the claims of ancient scripture, adherence to it, or an affirmation of any supernatural claim can be arrived at by criteria referenced in the definition of rational, I will be happy to consider my understanding of theological arguments expanded. The below appears to be the closest thing offered in the blog post to the rational foundations of Judeo- Christian myth. I would be keen then to understand, which measure of logic and reason is implemented to accept that Jesus Christ was the son of a God, born of a virgin, died for our sins and was resurrected. I would submit this is the minimum one must accept to define themself as a Christian in any meaningful sense. Or how an in-depth knowledge/understanding of religion/scripture (the claim) is relevant to whether this is a rational worldview. Or, indeed how deeper understanding of the sketchy historicity of Jesus actually helps to frame belief in Christian mythology as “rational”. This sounds a lot like faith to me, rather than rational thought. I have no issues with labelling it as the former. It’s honest. In closing, the blog entry in question appears to use me and my comment as a jumping off point to make predominantly unrelated criticism to any view I put forward, or implied. Constant objection is made to dismissal of religion as irrational, whilst asserting it does have a rational basis, without providing any clear counter-points or arguments to support this assertion. I agree that the furthering of “religious education” is important though. The difference is, I believe furthering our understanding in this area will serve not to provide a rational basis for belief, but rather highlight its unreliable origins and irrational nature. GS, you write a superb blog and your tweets are always highly entertaining. The quickness and aptness of your responses is an absolute joy. 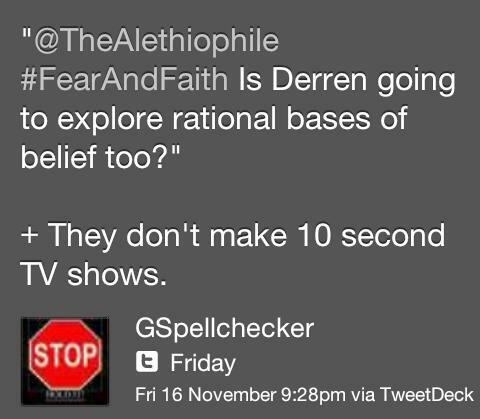 Has Derren confirmed himself as an atheist? I saw him on YouTube talking to Dawkins and assumed he might be leaning this way but seemed to remember reading in his autobiography some years ago that he believed in God and I was rather disappointed by this at the time. Thank you for the kind words. Yes, Derren Brown is a self-confirmed atheist. Are you sure about his autobiography? I seem to remember him stating that he was once religious, but decided to reject these beliefs during his time at University. I have heard him refer to himself as an atheist on several occasions, one of them being on this latest TV programme. How incredibly frustrating it is to have such a poor memory! I’ve just read the “Disillusionment” section again on Amazon and he couldn’t be more clear on the subject. Perhaps I read an earlier and possibly misquoted interview. Well, I wish you a merry and enjoyable festive season. I may renounce my atheism for a short while in order to worship at the altar of Bacchus/Dionysus! Basically one of the obvious problems with the ‘historical Jesus’ appeal is that the claims are infinitely stronger for other cases such as Sri Sathya Sai Baba. You cannot be logically consistent and accept the farcical historical Jesus while rejecting Sri Sathya Sai Baba. Well played, GS. To be honest, when you pick through and try and find the “substance” of his argument, even the most unbiased of reviewers must come to the conclusion that there isn’t any. You asked for evidence to support his rational beliefs, and you’re still waiting. I find this religious arrogance disturbing, particularly when he uses a scientific basis to justify his argument. You do it so well, I’m afraid my argument would disintegrate into name-calling in frustration, so please continue to crusade on the behalf of us mortals!